Marylebone station (/ˈmɑːrlɪbən/ ( listen) MAR-li-bən) is a Central London railway terminus and connected London Underground station in the Marylebone area of the City of Westminster. On the National Rail network it is also known as London Marylebone and is the southern terminus of the Chiltern Main Line to Birmingham. An accompanying Underground station is on the Bakerloo line between Edgware Road and Baker Street in Transport for London's fare zone 1. The station opened in 1899 as the London terminus of the Great Central Main Line (GCML), the last major railway to open in Britain in over 100 years, linking the capital to the cities of Nottingham, Sheffield and Manchester. Marylebone was the last of London's main line termini to be built, and is one of the smallest, having opened with half the number of platforms originally planned. It has had an interchange with the Underground Bakerloo line since the latter opened in 1907, but not any other lines. Marylebone station suffered from a lack of traffic and after the GCML closed in 1966, it declined in use. By the 1980s, it was threatened with closure, but was reprieved because of commuter traffic on the London to Aylesbury Line (a remaining part of the GCML) and from High Wycombe. In 1993 the station found a new role as the terminus of the Chiltern Main Line. Following the privatisation of British Rail, the station was expanded with two additional platforms in 2006 and improved services to Birmingham Snow Hill. In 2015 services began between Marylebone and Oxford Parkway via a new chord connecting the main line to the Oxford to Bicester Line and an extension to Oxford following in 2016. As of 2019, it is the only main London terminus without any electrified National Rail services. Marylebone is one of the squares on the British Monopoly board, and is popular for filming because of its relative quietness compared to other London termini. The station stands on Melcombe Place just north of Marylebone Road, a straight west-to-east thoroughfare through Marylebone in Central London; Baker Street is close by to the east and south-east. It is in the northern, Lisson Grove, neighbourhood of the district, in a northern projection of the Bryanston and Dorset Square ward immediately south of St John's Wood. 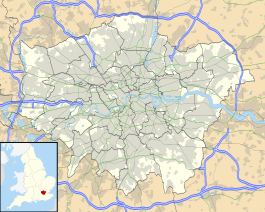 North-east is Regent's Park, north in a network of mostly residential streets is Lord's Cricket Ground and south, south-west and south-east are a mixed-use network of streets. Other nearby London termini are Euston and Paddington. A number of TfL bus routes serve the station. The main line station has six platforms; two built in 1899, two inserted into the former carriage road in the 1980s, and two built in September 2006. It is the only non-electrified terminal in London. Marylebone is operated by Chiltern Railways (part of Deutsche Bahn), making it one of the few London terminal stations not to be managed by Network Rail. Chiltern Railways operates all services at the station, accessing the Chiltern Main Line and London to Aylesbury Line routes which serve High Wycombe, Aylesbury, Bicester, Banbury, Leamington Spa, Warwick, Solihull, Birmingham Moor Street, Birmingham Snow Hill, and (at peak hours) Stourbridge Junction and Kidderminster. There are services to Oxford via the Oxford to Bicester Line, and some services to Stratford-upon-Avon via the Leamington to Stratford branch line. The early history of Marylebone is tied into the Great Central Railway (GCR)'s Great Central Main Line (GCML) extension into London. When Sir Edward Watkin became chairman of the Manchester, Sheffield and Lincolnshire Railway (MS&LR) in 1864, the line was not particularly lucrative as it had no direct connection to London. Watkin was unhappy about transferring traffic to the Great Northern Railway, and when he became chairman of the Metropolitan Railway in 1872, he decided to build a dedicated line between the MS&LR and Central London. The approach to Marylebone was the last section of the Great Central Main Line to be built. Progress was delayed in the 1890s because of objections, particularly as the line would pass through Lord's, the principal cricket ground in London and home of Marylebone Cricket Club. Watkin promised that Lord's would not be disrupted by the railway construction, and an act of Parliament to complete the line was passed on 28 March 1893. The station was built on a 51-acre (21 ha) site around Blandford and Harewood Squares, west of Regent's Park. More than 4,000 working-class people were evicted from their homes to turn Harewood Avenue and Rossmore Road into approach roads; around 2,600 of them were rehomed in new apartments near St. John's Wood Road. Watkin resigned the chairmanship in 1894 following ill health, and was replaced by Lord Wharncliffe. The approach to the station through Lord's was achieved by a cut-and-cover tunnel constructed between September 1896 and May 1897, avoiding the cancellation of any cricket. The station opened to coal traffic on 27 July 1898 and to passengers on 15 March 1899. It was the terminus of the GCR's London extension main line – the last major railway line to be built into London until High Speed 1. The Great Central Railway linked London to stations in High Wycombe, Aylesbury, Rugby, Leicester, Nottingham, Sheffield and Manchester. Local services from northwest Middlesex, High Wycombe and Aylesbury also terminated at Marylebone. The GCR moved its headquarters to Marylebone from Manchester in 1905. The station was designed by Henry William Braddock, a civil engineer for the GCR. It has a modest design owing to the GCR's lack of money. The main booking hall is 63 feet (19.2 m) by 40 feet 6 inches (12.3 m). It is a domestic version of the "Wrenaissance" revival style that fits in with the residential surroundings with Dutch gables, employing warm brick and cream-coloured stone. The GCR crest was worked into the wrought iron railings in numerous places. The original plan was for eight platforms, but half were designated as a "possible future extension" and the cost of building the GCML was greater than expected. The line leading to the station cut through 70 acres (28 ha) of middle-class housing, including the Eyre Estate in St John's Wood and the area around Lord's, drawing protests and requiring a relocation of the track and station facilities. There was never enough money for the extra platforms, and only four were built, three inside the train shed and one to its west (platform 4). As a result, the concourse is unusually long and had three walls for most of the 20th century. The northern wall was missing, as the GCR anticipated that the other four platforms, under an extended train shed, would be built later on. An office block was later built on the vacant site. The cost of the London Extension meant that the adjoining Great Central Hotel, designed by Sir Robert William Ellis, was built by a different company. The hotel operated for a relatively short time and was converted to offices in 1945, becoming the headquarters of British Rail from 1948 to 1986. The offices were restored as a hotel in 1993. The GCR constructed an engine shed at the site in 1897, but it was short lived. A locomotive servicing area, consisting of a turntable and coaling stage remained in use until the end of steam traction at the station in 1966. Passenger traffic on the GCR was never heavy because it was the last main line to be built and had difficulty competing against longer-established rivals (especially the Midland Railway from its terminal at St Pancras) for the lucrative intercity passenger business. Low passenger traffic meant Marylebone was the quietest and most pleasant of London's termini. The GCR was unhappy about having to use part of the Metropolitan Railway's route to reach Marylebone, and opened a new line to High Wycombe on 2 April 1906. The additional suburban services generated traffic for the station, which had previously been so empty on occasion that the staff outnumbered passengers. While passenger traffic remained relatively sparse, the line was heavily used for freight, especially coal; in 1914, 67% of traffic was goods-related. Trains ran from the north and East Midlands to the freight depot adjoining the station, which was marginally the largest in London. The heyday of the line was between 1923, when the GCR was absorbed into the London and North Eastern Railway (LNER) and 1948, when the LNER was nationalised to form the British Rail Eastern Region. As a result, many prestigious locomotives, such as Flying Scotsman, Sir Nigel Gresley, and Mallard which ran on the East Coast Main Line, were frequent visitors to the line. Special trains ran on the line to destinations such as Scotland. The station's busiest use came after the construction of Wembley Stadium in 1923, when it was used to contain large crowds wishing to see the FA Cup Final. Special services ran from Marylebone to the British Empire Exhibition at Wembley Park the following year. Unlike other London termini, Marylebone saw little direct damage during the Blitz. It was closed between 5 October and 26 November 1940 after the approach tunnels were breached, and the goods depot was bombed on 16 April 1941. After the nationalisation of British Railways in 1948, Marylebone was initially kept open as a long-distance station. New services were introduced, including the Master Cutler service to Sheffield and the South Yorkshireman to Bradford, but they were not well-used. From 1949, all local services towards High Wycombe and Princes Risborough were routed into Marylebone, although the frequency of trains was reduced two years later. The Great Central Main Line duplicated the route of the Midland Main Line and long-distance trains from Marylebone were scaled back from 1958, leading to the closure of the Great Central Main Line north of Aylesbury on 4 September 1966 in the Beeching Axe. The rundown of services began after the line was transferred from British Railways' Eastern Region to the London Midland Region, although the station and the first few miles of its route had been part of the Western Region from 1950. In 1958, the Master Cutler was diverted to London King's Cross and the East Coast Main Line. In 1960 all express services were discontinued, followed by freight in 1965. From then until closure, only a few daily long-distance "semi-fast" services to Nottingham remained. Marylebone's large goods yard was closed and sold to the Greater London Council for housing. The last long-distance service ran on 4 September 1966, except for a brief reprieve the following year when Paddington was undergoing signal works. Marylebone was then the terminus for local services to Aylesbury and High Wycombe only, with some services extended to Banbury. They were switched to diesel multiple unit (DMU) operation following the phasing out of steam. British Rail Class 115 DMUs were introduced to local services in 1962. The station was transferred from the Western Region to the London Midland Region in 1973. The Great Central Railway's long-distance connection from Marylebone via High Wycombe, was closed the same year. After the 1960s, lack of investment led to local services and the station becoming increasingly run down. By the early 1980s, Marylebone was under serious threat of closure. In 1983, British Rail chairman Peter Parker commissioned a report into the possibility of converting Marylebone into a 'high-speed bus way', whereby Marylebone would be converted into a coach station. The tracks between Marylebone, Harrow-on-the-Hill and South Ruislip would have closed, and been converted into a road for the exclusive use of buses and coaches. British Rail services via High Wycombe would have been diverted into Paddington, and the Aylesbury services would have been taken over by London Underground on an extended Metropolitan line, and then routed to Baker Street. British Rail formally announced plans to close Marylebone on 15 March 1984, pending a statutory consultation process, and closure notices were posted at the station. The proposals proved controversial and faced strong opposition from local authorities and the public, leading to a legal battle which lasted for two years. Despite the pending closure, passenger numbers only dropped by about 400 per day from 1968 levels. The conversion project proved impractical due to the headroom limitations on the line and the closure was quietly dropped. The main trainshed at Marylebone in 2012, with platforms 3–1. The station was revived under the control of the Network SouthEast sector of British Rail. The introduction of the inter-modal and unlimited use Capitalcard (now known as the Travelcard) led to a sharp rise in commuters into London, absorbing the spare capacity at Paddington and Baker Street and eliminating the possibility of Marylebone's services being diverted. Marylebone was reprieved from the threat of closure on 30 April 1986, and an £85 million modernisation and refurbishment programme of the station and its services was granted. This was funded by selling part of the station to developers, including two of the original four platforms at the west of the station and the third span of the train shed. In order to replace these, the central cab road was removed, and two new platforms numbered 2 and 3 were created in its place. The run-down lines into Marylebone were modernised with new signalling and higher line speeds. In 1991, the fleet of Class 115 trains on local services was replaced by Class 165 Turbo trains, and service frequencies were increased. 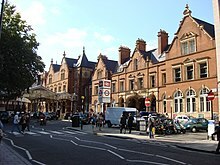 Services to Banbury were extended to the reopened Birmingham Snow Hill station in 1993, creating the first long-distance service into Marylebone since 1966. Initially this service ran at two-hourly intervals, but it proved popular and was increased to an hourly frequency in 1994. After rail privatisation, Chiltern Railways took over the rail services in 1996 and developed the interurban service to Birmingham Snow Hill. In 2002, a service to Kidderminster was opened. The line was restored to double track the same year, and Marylebone was expanded in 2006 with two extra platforms in Chiltern's Evergreen 2 project. A new platform (platform 6) was inaugurated in May 2006, while Platform 5 and the shortened platform 4 opened in September. Platforms 5 and 6 were built on the site of the goods sidings and a depot was opened near Wembley Stadium railway station. Platforms 5 and 6 were added in 2006 as part of Chiltern Railways' Evergreen 2 project. In September 2007, the Office of Rail Regulation granted the Wrexham Shropshire & Marylebone Railway (WSMR) Company permission to operate services from Wrexham in North Wales via Shrewsbury, Telford and the West Midlands to Marylebone; they started in early 2008, restoring direct London services to Shropshire (Wrexham already being served by a Virgin Trains service to Euston), with five return trips per day on weekdays. This was reduced to four trains a day in March 2009. These services ceased in January 2011 after passenger number reduced; the closure was blamed on the Great Recession. In December 2008, it was proposed to restart direct services between Aberystwyth in mid-Wales and London, which last ran in 1991, with Marylebone as the London terminus. Arriva Trains Wales announced a consultation for two services a day, following the route of the WSMR connecting with the Cambrian line at Shrewsbury. This idea was abandoned following objections by Wrexham & Shropshire. In 2011, Chiltern Railways took over the Oxford to Bicester Town route from First Great Western, in preparation for the opening of a link from the Chiltern Main Line to the Varsity Line (on which Bicester Town station is located), which would see twice-hourly services from Marylebone to Oxford. Construction was expected to start in 2011 but was delayed until the following year after bats were found roosting in one of the tunnels on the Varsity line. Services to Oxford Parkway started in October 2015 and services to Oxford began in December 2016. In 2017, Network Rail proposed an upgrade of Marylebone with 1,000 extra seats on trains approaching the station. These improvements are planned to be complete by 2024. Beyond this, improvements to Old Oak Common station are planned to relieve congestion at Marylebone. In a study by Network Rail it was said that any expansion of the station could cost up to £700 million with Old Oak Common a more feasible alternative for capacity increase. Additional services run in the peak hours, and some Birmingham trains extend to Kidderminster or Stourbridge Junction. The station opened with a dining restaurant and a buffet. The restaurant was changed to a self-service operation when British Rail took over in 1948. The Victoria and Albert bar opened on 14 December 1971. In the 21st century, the concourse contains a small selection of shops. On 28 March 1913, a train leaving for High Wycombe collided with another arriving from Leicester, killing one passenger and injuring 23 people on the incoming train. The cause was blamed on the intermediate starter signal being lowered before the main starter was ready; the view of the latter was obscured by the smoke. On 11 December 2015, a train pulling into the station caught fire, causing it to be evacuated. The cause was believed to be a fault in its air conditioning unit. The London Underground station is on the Bakerloo line between Baker Street and Edgware Road stations and is, along with the main line station, in Transport for London fare zone 1. Access is via escalators from the main line station concourse which houses the Underground station's ticket office. Until 2004, a wooden escalator led into the station, one of the last on the London Underground system that had not been replaced as a consequence of the King's Cross fire in 1987. Marylebone has direct connections with just a single Tube line, unlike many other London termini such as Euston and Paddington. There is no direct interchange with the Circle line, which predates the station by more than 30 years and bypasses it to the south. The nearest stations on the Circle line are Edgware Road and Baker Street. The underground station was opened on 27 March 1907 by the Baker Street and Waterloo Railway under the name Great Central (following a change from its intended name Lisson Grove). The railway terminated here until the extension to Edgware Road opened on 15 June. The station was renamed Marylebone on 15 April 1917. The original name still appears in places on the platform wall tiling, although the tiling scheme is a replacement designed to reflect the original scheme. The present entrance opened on 1 February 1943 following wartime damage to the original station building that stood to the west at the junction of Harewood Avenue and Harewood Row and the introduction of the escalators. The old building, designed by the Underground Electric Railways Company of London's architect, Leslie Green, had used lifts to access the platforms. It was demolished in 1971 and the site is occupied by a budget hotel. As one of the quietest London termini, Marylebone has been popular as a filming location. In particular, several scenes in The Beatles' film A Hard Day's Night were filmed there in April 1964, as was the opening scene of the 1965 film of The IPCRESS File and the 1978 film of The Thirty-Nine Steps (standing in for St Pancras). The station continues to be so used according to Film London. Marylebone is one of four London termini on the British version of the Monopoly board game, along with King's Cross, Fenchurch Street and Liverpool Street. At the time the board was designed in the mid-1930s all the stations were being operated by the LNER. ^ a b c d e f g h i "Station usage estimates". Rail statistics. Office of Rail Regulation. Please note: Some methodology may vary year on year. ^ "Marylebone Station". Google Maps. Retrieved 29 November 2016. ^ "Central London Bus Map" (PDF). Transport for London. Archived from the original (PDF) on 13 March 2017. Retrieved 12 December 2016. 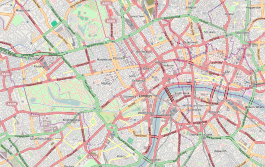 ^ "Central London night bus map" (PDF). Transport for London. Archived from the original (PDF) on 13 December 2016. Retrieved 12 December 2016. ^ "Marylebone Station". Chiltern Railways. Retrieved 19 November 2016. ^ "CR1612 Routecard" (PDF). Chiltern Railways. Archived from the original (PDF) on 30 December 2016. Retrieved 30 December 2016. ^ "Oxford Parkway to London Marylebone". Chiltern Railways. Retrieved 30 December 2016. ^ "Destination Stratford". Chiltern Railways. Retrieved 30 December 2016. ^ a b Jackson 1984, p. 332. ^ a b McCarthy & McCarthy 2009, p. 74. ^ a b Christopher 2015, p. 48. ^ a b Simmons & Biddle 1997, p. 189. ^ a b Weinreb et al. 2008, p. 535. ^ a b Jackson 1984, p. 335. ^ Weinreb et al. 2008, pp. 534–535, 797. ^ a b c Jackson 1984, p. 340. ^ a b Jackson 1984, p. 341. ^ a b c d e Jackson 1984, p. 342. ^ "Revision of Regional Boundaries of British Railways". The Railway Magazine. London. 96 (587): 201–4. March 1950. ^ "Housing Review". 16. Housing Centre. 1967: 50. ^ a b Haywood 2016, p. 189. ^ a b "Almost Terminal: Marylebone's Brush With Destruction". London Reconnections. 20 February 2014. Retrieved 15 September 2015. ^ a b Jackson 1984, p. 371. ^ a b "Marylebone Station Celebrating 30 Years Since Threatened Closure" (PDF). St Marylebone Society. Summer 2014. Retrieved 21 November 2016. ^ Boynton, John (2001). Main Line to Metro: Train and tram on the Great Western route: Birmingham Snow Hill – Wolverhampton. Mid England Books. p. 70. ISBN 978-0-9522248-9-1. ^ "On track". Railway Strategies. August – September 2009. Retrieved 3 January 2017. ^ "£250m Rail Investment to Slash Journey Times and Create New Oxford-London Route". Network Rail Media Centre. 15 January 2010. Retrieved 27 November 2016. ^ "Job completed!" (PDF). The Railway Consultancy. June 2006: 2. Retrieved 30 November 2016. ^ "Marylebone Railway Station". LondonTown. Retrieved 28 November 2016. ^ "WSMR cuts service". Modern Railways. London. April 2009. p. 6. ^ "Wrexham-Shropshire-London direct rail link to end". BBC News. 26 January 2011. Retrieved 27 November 2016. ^ "Aber-London rail link may reopen". BBC News. 19 December 2008. Retrieved 31 December 2016. ^ "Aberystwyth to London direct rail route rejected". BBC News. London. 1 March 2010. Retrieved 1 March 2010. ^ "New £320m Oxford to London Marylebone rail line opens". BBC News. 26 October 2016. Retrieved 29 November 2016. ^ "Next stop central Oxford – open from 12.12.2016". Chiltern Railways. Retrieved 29 November 2016. ^ Enabling progress and facilitating growth : A rail strategy for the Chilterns and East West Rail (PDF) (Report). Network Rail. pp. 4, 5. Retrieved 18 August 2017. ^ "Download our timetable". Chiltern Railways. Retrieved 30 December 2016. Select the individual timetables to verify the destinations and frequencies. ^ "National Rail – London Marylebone station plan". ^ "London Marylebone Station closed after train fire". BBC News. 11 December 2015. Retrieved 28 November 2016. ^ a b c "Tube Map" (PDF). Transport for London. Retrieved 19 November 2016. ^ Platt, Geoff (2015). The London Underground Serial Killer. Wharncliffe. p. 54. ISBN 978-1-473-85829-9. ^ Rose, Douglas (1999). The London Underground, A Diagrammatic History. Douglas Rose/Capital Transport. ISBN 1-85414-219-4. ^ Rose, Douglas. "Great Central". London's Underground Edwardian Tile Patterns. Archived from the original on 28 August 2008. Retrieved 13 January 2008. ^ Menear, Laurence (1983). London's underground stations: a social and architectural study. Midas. p. 43. ISBN 978-0-859-36124-8. Clough, David (2013). Dr Beeching's Remedy – A Cure for a Century of the Railway's Ills. Ian Allan. ISBN 978-0-7110-3542-3. Christopher, John (2015). London's Historic Railway Stations Through Time. Amberley Publishing. ISBN 978-1-445-65111-8. Day, John R. (1979) . The Story of London's Underground (6th ed.). Westminster: London Transport. ISBN 0-85329-094-6. 1178/211RP/5M(A). Demuth, Tim (2004). The Spread of London's Underground. Capital Transport Publishing. ISBN 1-85414-277-1. Dow, George (1962). Great Central, Volume Two: Dominion of Watkin, 1864–1899. Shepperton: Ian Allan. ISBN 0-7110-1469-8. Harris, Ken (2008). Jane's World Railways. Jane's Information Group. ISBN 978-0-710-62861-9. Girling, Brian (2013). Lost London in Colour. Amberley Publishing. ISBN 978-1-445-61512-7. Glynn, Stephen (2005). A Hard Day's Night: The British Film Guide 10. I.B.Tauris. ISBN 978-1-850-43587-7. Griffiths, Roger; Smith, Paul (1999). The directory of British engine sheds 1. Oxford Publishing Co. p. 91. ISBN 0-86093-542-6. James, Simon (2007). London Film Location Guide. Anova Books. ISBN 978-0-713-49062-6. McCarthy, Colin; McCarthy, David (2009). Railways of Britain – London North of the Thames. Hersham, Surrey: Ian Allan Publishing. p. 74. ISBN 978-0-7110-3346-7. Moore, Tim (2003). Do Not Pass Go. Random House. ISBN 978-1-409-02216-9. Riddaway, Mark; Upsall, Carl (2015). Marylebone Lives: Rogues, romantics and rebels – character studies of locals since the eighteenth century. Spiramus Press Ltd. ISBN 978-1-910-15103-7.
Business Plan 2006 – Route 16: Chilterns (PDF) (Report). Network Rail. 2006. Archived from the original (PDF) on 5 April 2015. Retrieved 29 November 2016. Wikimedia Commons has media related to Marylebone station.